This year, The Isabella Blow Foundation has had the privilege of working in partnership with Hospital Rooms. Co-founded by artist Tim A Shaw and curator Niamh White, Hospital Rooms is an independent charity which brings extraordinary art to people who are cared for in mental health hospitals. 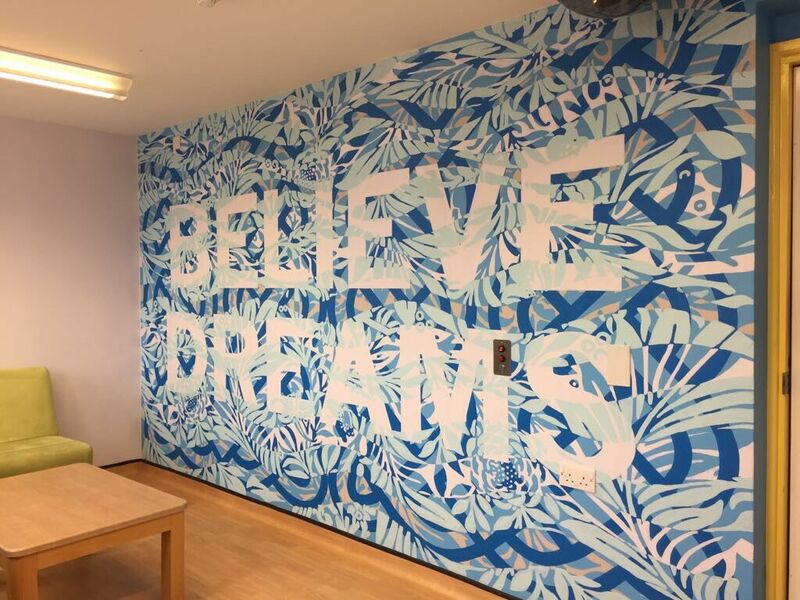 They are the only organisation that commissions world class artists to work with mental health patients and staff to radically transform challenging clinical environments, such as Psychiatric Intensive Care Units, and make them imaginative, thoughtful and restorative. The work they do is close to The Foundation’s heart, and very much aligned with our central objectives. Through financial contribution, the IBF have been able to assist this important charity – and we hope to continue to do so in the future. The Isabella Blow Foundation is proud to announce the launch of a new partnership with Samaritans. Samaritans is an iconic service, running in the UK and Republic of Ireland now for over 60 years. Last year, its volunteers responded to more than 5.3 million calls for help from people struggling to cope, by phone, text, email and face to face in its 201 branches. The Isabella Blow Foundation is delighted to be able to support a service that is committed to creating a safe space, where anyone can talk in confidence, without being judged, in ways they feel most comfortable with. Sadly, a recent survey for Samaritans revealed that more than 1 in 5 people sometimes feel overwhelmed by their problems, with 1 in 9 feeling they have no one to share them with. We are also honoured and grateful to announce that The Isabella Blow Foundation has been named as one of this year‘s ICAP Charity Day beneficiaries. In previous years, ICAP’s prestigious Charity Day fundraising event has seen support from the Royal Family alongside the likes of Meryl Streep, Jamie Oliver and Kylie Minogue. Last year’s event raised £8m and a total of £120m has been raised since it launched 22 years ago. The funds raised at ICAP’s Charity Day will be used to fund a landmark new access service for Samaritans which it hopes to pilot in 2016. Samaritans is available round the clock, every single day of the year, providing a safe place to talk for anyone who is struggling to cope, whoever you are and whatever life has done to you. Please call 116 123 (this number is FREE to call and will not appear on your phone bill), email jo@samaritans.org, or visit www.samaritans.org to find details of your nearest branch. This charitable Foundation seeks to honour the memory of Isabella Blow, to support aspiring art and fashion students and to facilitate further research in the fields of depression and mental health. To promote British fashion and encourage young and aspiring art and fashion students. To create bursary and scholarship funds, enabling students to develop their aspirations and careers in the art and fashion worlds. To develop, curate and establish a public exhibition of Isabella’s clothing. The social, cultural and historical significance of the collection cannot be underestimated and the Foundation would seek to exhibit the collection at a number of venues around the world. To raise awareness and allocate financial resources to charities working within the areas of depression and mental health. The Isabella Blow Foundation and Hudson’s Bay are thrilled to announce “Fashion Blows”, a fundraising event and exhibit celebrating the extraordinary life and wardrobe of the late British patron of fashion and art, Isabella Blow. The Isabella Blow Foundation in conjunction with Somerset House and Central Saint Martins, presented Isabella Blow: Fashion Galore!, a major fashion exhibition celebrating the extraordinary life and wardrobe of the late British patron of fashion and art. More Details on Fashion Galore! Highlights from The Daphne Guinness Collection; Sold to Benefit the Isabella Blow Foundation, a spectacular single-owner evening auction took place on 27 June 2012 at Christie’s South Kensington saleroom.